Here’s some comfort food for those of us who grew up in the 50’s and 60’s…tomato soup – we always had it with grilled cheese sandwiches at our mother’s table. 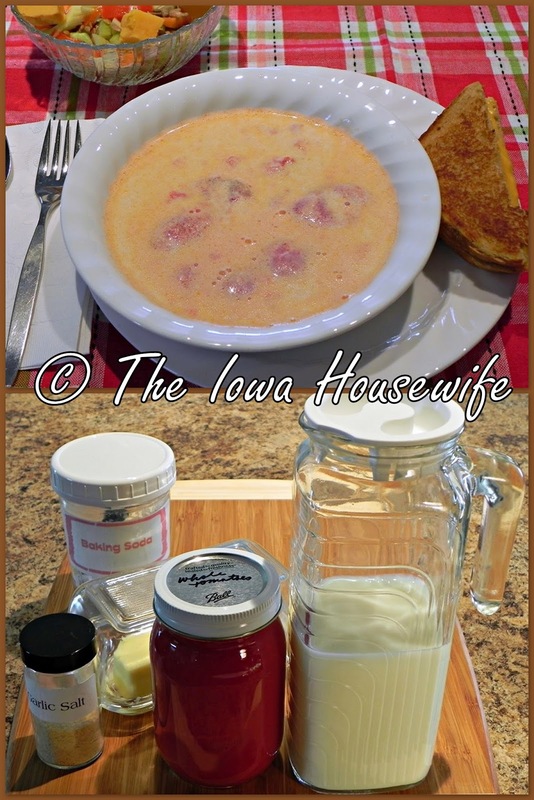 This recipe, from the "Taste of Home Soups” soft cover cook book 2014, is so simple and good it’s amazing! I used home-canned whole tomatoes I cut up a little, and the flavor was great. You don’t have to puree, and with no other thickening, it’s gluten-free as well. The goodness of the tomatoes shines through with the very simple seasoning. I used a little less milk the second time I made this so it tasted more of the tomatoes, and we really enjoyed it with a small salad and grilled cheese sandwiches, of course. In a large saucepan, bring tomatoes to a boil. Add baking soda, garlic salt, salt and pepper. Reduce heat; add the milk and butter. Heat through, but do not boil. 1 pint of home canned or freshly stewed tomatoes with liquid can be substituted for the purchased canned tomatoes. Per Serving: 148 Calories; 9g Fat (56.0% calories from fat); 6g Protein; 11g Carbohydrate; 1g Dietary Fiber; 32mg Cholesterol; 315mg Sodium. Exchanges: 1/2 Vegetable; 1/2 Non-Fat Milk; 2 Fat; 0 Other Carbohydrates. It looks delicious. And, the recipe seems easy enough. Only thing is I would have to substitute grocery store tomatoes. I LOVE homemade canned tomatoes. They are so delicious. Happy weekend. It's going to be a rainy stormy weekend here in Mississippi again. Well, it's originally calling for grocery store tomatoes...I may make this tomorrow as it's cold, windy, and has rained this afternoon, and may do so again tomorrow. Comfort food! I don't think I'd ever try to make this since I'm the only one to eat it. I grew up on Campbell's Tomato Soup prepared with milk. It seems to be the only kind I like. I like their Old-Fashioned Tomato Rice soup too. I can't get enough tonato anything! I am looking forward to making this soup. Thanks so much for the recipe.